Our family loved the Star Wars movies, so this ride was our favorite of all the rides at Disney. My little sister and my dad both get sick very easily, but this ride was fine for both of them. It truly does have different clips that they put together, so we got completely different experiences each time we rode. My sister and my mom both got chosen as the rebel spy, and that really made their day. If you liked the Star Wars movies, you will love this 3D adventure! This was an attraction that my DS and I enjoyed on our May 2010 trip. The revamp was hyped and we were pumped to give it a whirl during our September trip. We rode 5 times and each was a different experience. The highlight of our day in Hollywood Studios was the last of these rides. For those who don't know, the story is that you have a rebel spy hiding on board. Prior to take off, someone, usually Vader, stops your ship and identifies the spy which is one of the riders. First four rides, my son had his hopes dashed. After the 4th ride we left to meet up with my wife and daughter. He was upset, but he is 8 and got over it quick. This process was moved along by me agreeing to pay to have his face painted like Darth Mauls. This was done at a stand across from TSMM. It was well done, but in a case study on why I am campaigning for the repeal of the 19th amendment, every male that commented on his face paint identified it as Darth Maul and every woman called him Spiderman. Anyway, he asked if we could ride again to see if they would pick him. I agreed but told him to try to be ok if they do not pick him. We get into our seats and he was selected. He was the Rebel Spy. He beamed for the rest of the night. When we got off the ship, which of course deposits you in a gift shop, I spotted a "I was the Rebel Spy" t-shirt. He did not see it and I was given the perfect daddy out. If he did not see it it did not happen. This was tempting because, eventhough we were only on our 3rd day of a 6 day vacation he had spent all of his $60 gift card after I warned him to hold off. At that point I realized a couple of things. One, I was trying to talk since to an 8 year old when most adults lack the ability to budget. And second, I had the chance to earn serious dad points. So, he I bought him the shirt. *Unintended consequence alert* If you try to look good by buying a $25 shirt for your son, realize you will have to buy something of equal, or greater, value for your daughter. Dang you George Lucas. And keeping with all my other reviews, I have to find a way to work in an insult of Pecos Bill........ Ok, I have it..... Unlike Pecos Bill, Star Tours is so good, that I did not get violently ill considering experiencing it again. Taaaadaaaaaaa. Recap- Star Tours: A Pecos Bill: Hopefully going to be turned in to a DVC booth. When people ask me what my favorite attraction in Walt Disney World is, I used to say I didn't know. But now the answer is clear: Star Tours. Ever since they redid this amazing attraction, I have considered it to be my favorite without a doubt, and not simply because I am a Star Wars nerd (see the name?) The old Star Tours was, to be frank, just that. OLD! I never used to like it, since it would make me motion sick. It felt like you were in a big box that's moving and shaking you around (which, well, it what it is) and not like a flight through space. Let's face it, the technology utilized in Mission: Space left Star Tours in the dust, and wait times were declining more and more, and going up and up on other rides (coughToyStoryManiacough). The technology on this one is completely awesome. It no longer makes me motion sick because it feels more real than the old technology did. And get ready for it: It's in 3D!!! Even if 3D normally gives you a headache, like it used to do for me, this technology is much better and is less likely to make you dizzy or give you a headache. Another problem with the old attraction was the lack of it being "Star Wars". If you come to a park expecting Star Wars, you want Star Wars. You saw the Death Star and some rebel troupes, and that was it. Additionally, the only three characters from the films in the original were Chewbacca, Threepio, and Artoo, and all of them made brief appearances. In this attraction, Threepio plays a prominent role, and you can see other characters too, but not all at once. Why? There are many new combinations of experiences on Star Tours. There's around 15 elements that can be combined in many different ways. So sometimes, you'll see Darth Vader. Other times, you meet Gunguns on Naboo (Episode 1 reference) with Jarjar Binks, the most unpopular Star Wars character ever, making a brief cameo. Princess Leia may send you a hologram, with specific instructions to help the rebellion. You may get to visit the ice world of Hoth (Episode 5), but not without encountering a few imperial walkers. The possibilities are endless. Characters appearing include Princess Leia, Darth Vader, Chewbacca, among others. Although the actual layout of the ride hasn't changed much, the Queue area is very cool. There are many droids doing their duty throughout, signs, and information boards to make it seem like a real spaceport. And the droids? Be careful, you may get picked out by them. Captain Rex (from the original Star Tours) even makes an appearance, so look out for him. Consensus? The new Star Tours is a MUST SEE!!! The ride is set in between the events of episodes 3 and 4, and is a prequel to the original, set after episode 6. My daughter who is a HUGE Star Wars fan loved this ride. She said that Star Tours is the best ride ever. We had to go on it four times. When we go in December we are probably going on it four times or more, which is what we did the last time we were there. 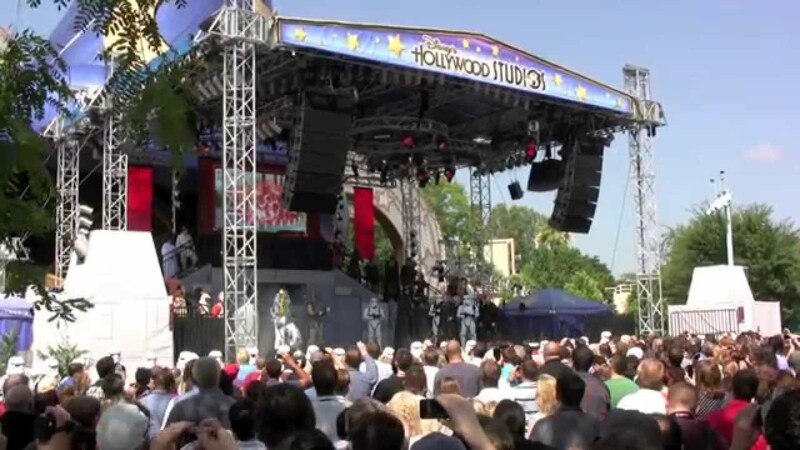 "Star Tours - The Adventures Continue" is a new version of Star Tours that opened at Disney's Hollywood Studios on May 20 2011. 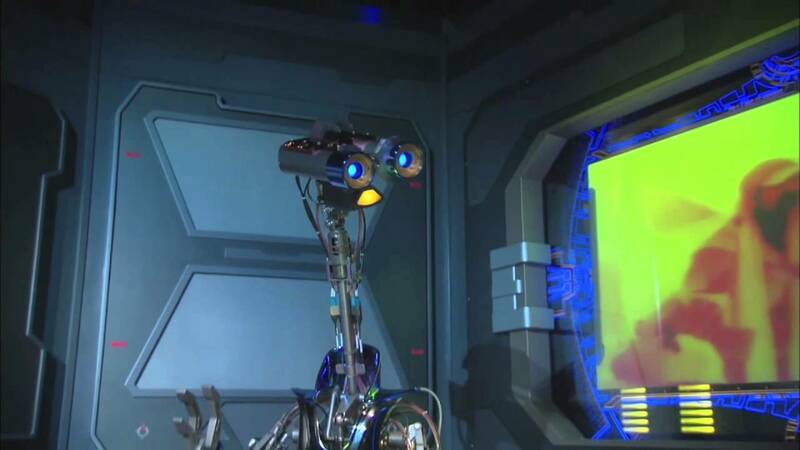 The new ride uses the existing ride system of Star Tours, but features an updated queue, new in-cabin effects, more than 50 different ride scenarios, and brand-new 3D imagery (see video). Click here for information on the original Star Tours attraction that closed in September 2010. Announced previews: Limited number starting 00:01 on May 20 2011 (see details). Official opening: May 20 2011 at midday. "Star Tours - The Adventures Continue " was announced on 12 September 2010 at the D23 Expo in California after 10 years of speculation. Star Tours closed on 8 September 2010 to begin the Star Tours II 3D refurbishment. The power of the Force and the magic of Disney have combined to create “Star Tours – The Adventures Continue,” a new 3-D attraction set to open at Disney's Hollywood Studios theme park on May 20, 2011. The attraction also will open at Disneyland Park in Anaheim, Calif., on June 3, 2011. With an eye-popping digital presentation leveraging Dolby 3-D to deliver a vivid and realistic experience, a dramatic musical score and motion simulator-based technology, guests will be immersed in the Star Wars galaxy like never before on a theme park attraction. Approximately 7 minutes (including boarding at Starspeeder gate). Actual show is approximately 4.5 minutes. Walt Disney Imagineering, working with Lucasfilm Ltd. and Industrial Light & Magic.